Today I when I came back home from school, I was welcomed with two very pleasant surprises! They were slips from the post office saying that I had to pick up two of my packages! I didn’t really know what they were so I was pretty excited. The post lady gave me two boxes – one that was big and another that was relatively small. The smaller one was the Skin79 Oriental Gold BB Cream that I ordered! I was very keen on trying BB Cream after hearing other beauty bloggers/vloggers rave on about how amazing it was. This was recommended to me by Chelsi! (Check out her blog~!) I’ll do a review on it soon, hopefully this weekend. Dead Master is one of the evil characters in the Black Rock Shooter OVA. I became obsessed with Black Rock Shooter over the summer when Ringo and I started watching it! (I got especially obsessed with Black Gold Saw, hehe ♥) Anyway, I originally didn’t like Dead Master because I thought she was annoying and didn’t really like her design. Jean told me to wait because “Dead Master grows on you.” Haha, she couldn’t be more right! I started to feel more attached to her character. Clothing detail! The ruffles are so nicely made! 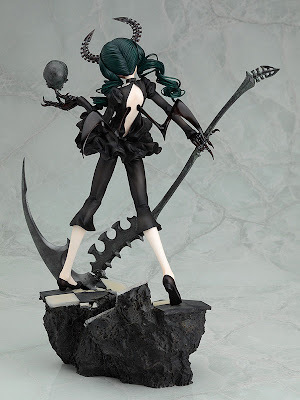 I want to collect all of the Black Rock Shooter evil characters. (BGS, DM, STR), but they’re all kind of expensive! A friend is ordering the BGS figma for me and will give it to me at Anime North, so I’m super excited for that.